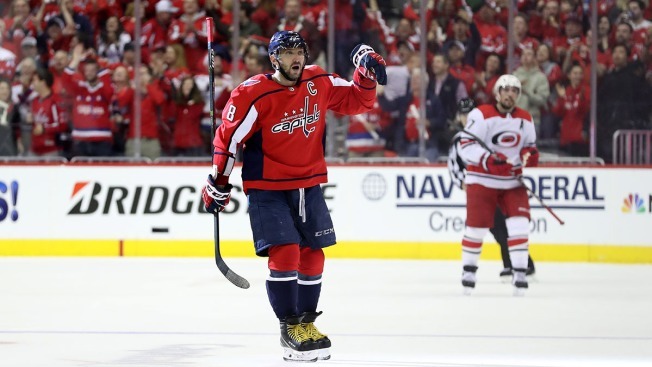 Alex Ovechkin celebrates after scoring a first period goal against the Carolina Hurricanes in game one of the Eastern Conference first round. The Carolina Hurricanes are hosting their first playoff game in a decade tonight, and they've got their work cut out for them. The defending Stanley Cup champion Washington Capitals have a 2-0 lead in their best-of-seven Eastern Conference first round series. The Capitals are 19-7-2 against opponents from the Metropolitan Division. Washington is second in the Eastern Conference shooting 11.0 percent and averaging 3.3 goals on 30.4 shots per game. The teams’ meeting Monday is their seventh this season. The Capitals won the last meeting 4-3 in overtime Saturday.